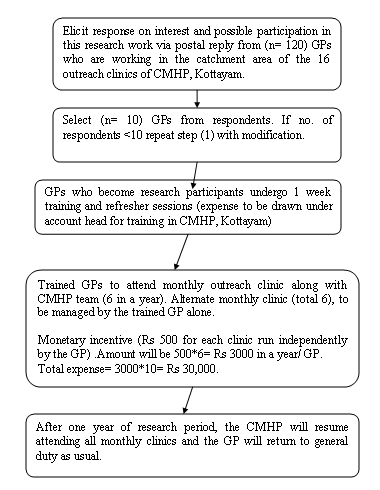 Home » DMHP » Research Proposal From CMHP-Kottayam. Sub: Submission of a proposal for research study in Kottayam district under the Community Mental Health program. It is heartening to understand that conducting research activities is also very much a part of the DMHP/CMHP programmic architecture. The monthly reports which are being furnished from the district have explicit instructions to furnish details of the research activities done during the month. As you are aware research activities cannot be planned on a monthly basis as it involves discussion on research design, ethical approval and funding support. Therefore I submit the following research proposal as an abridged statement of interest for conducting research in my district. Procedure for getting ethics approval for conducting research as part of DMHP/CMHP activities. The funding head of account for research based activities. What other procedures need to be followed. The primary role of research in the context of DMHP is to….reduce the treatment gap. As the ICMR already supports clinical and epidemiological research and the DBT supports aetiology and basic sciences research, it is recommended that the DMHP (or NMHP) conduct health policy and systems research in order to provide guidance about how to increase access to cost-effective treatments. In particular, the emphasis in these priorities is to better understand how to deliver what we know works in an affordable manner, which has been referred to as ‘implementation’ science. Research-Proposal-Proper as an abridged statement of interest. In keeping with the mandate of NMHP I have selected an operational research question which aims to test the implementation of primary care integration of mental health care by trained GPs in the health department via an incentive augmented task-shifting paradigm. General Practitioner run outpatient clinic for mental health: Exploring the feasibility and role of monetary incentive as a motivational factor. Idea put forward by Ramkumar G. S. MD, Field Psychiatrist, Community Mental Health Program, Kottayam District. With many years of experience with the training of General Practitioners (GPs) in Mental Health service delivery ever since the conceptualization of the National Mental Health Program (NMHP) in 1983, it has become clear that training is not correlated to service roll out in the periphery. The ICMR –DST study on severe mental morbidity (1987 Report) had forewarned that even though General practitioners gained knowledge after training their actual performance over a one year period was not good. Based on certain anecdotal reports it is possible to believe that DMHP Thiruvananthapuram may have had some success in GP delivered mental health care, however we have report from northern Kerala and other parts of India that training alone does not translate to practice. The reasons may be due to include lack of motivation and not being adequately incentivised for taking up this work, rather than just skill or confidence deficit. Incentives have a major role in motivating health care professionals in running various public health programs. In a Cochrane systematic review (1) it was noted that financial incentives are being increasingly utilized for bettering health care delivery, though convincing research evidence is not available to support it unequivocally. In the review which evaluated seven studies it was found that there were positive outcomes of modest sizes in some, if not all, outcome measures like quality of care. In the Indian context GPs working in facilities designated as rural areas are awarded rural service incentives (Rs 3000 per month), those working in difficult rural areas with special health packages are awarded (Rs 20,000 per month in addition to regular salary), those enhancing IP and lab facilities in their facility under the RSBYN scheme are awarded patient care allowances. Health workers involved in facilitating hospital delivery in Janani Suraksha Yojana (JSY) is another example of performance based financial incentive practice. 1. To explore whether a modest financial incentive will motivate a trained GP in running a mental health OP in a peripheral health centre and thus increase access to care to patients in the periphery. 2. To quantify the financial burden of this initiative for purpose of policy prescription. Comparison of study group with the control group. Status quo situation which is that no GP have come forward for delivering mental health care in the periphery even after providing training for some of them about six months back. 1. No of mental health clinics in the periphery managed independently by trained GPs. 2. No of patients who received mental health care in GP run clinics as a reflection of increased access to care. 1. Percentage of response to request for participation in this research work as a measure of interest in financial incentive based care. 2. Number of GPs who completes one year of running mental health clinics. 3. Assess GP comfort level in running mental health clinic and willingness to continue it if it becomes a policy decision. 4. Patient satisfaction levels with GP run mental health clinics. (3) The Nodal office which handles the finances is attached to the medical education department. If a performance based financial incentive is found to work, the financial implication to the exchequer may be duly ascertained for a possible scale up of primary care integration of mental health care in the NMHP via a sustainable performance based financial incentive model. 1. Scott A, Sivey P, Ait Ouakrim D, et al. The effect of financial incentives on the quality of health care provided by primary care physicians. Cochrane database Syst. Rev. 2011;(9):CD008451. Available at: http://www.ncbi.nlm.nih.gov/pubmed/21901722. Accessed January 27, 2014. By kumarRam in DMHP, Outreach Mental Health Clinic, Services & Policy on February 16, 2014 . It would be sensible to have a randomised control design with one arm being GPs given financial incentive and the other without. This would ascertain if the financial incentive is really the main factor for persuading GPs. What are the other factors that you think you might want to control for?